You don't have to wait until Valentine's Day to get out and do something fun. Check out these 50 things to do in Connecticut this weekend. 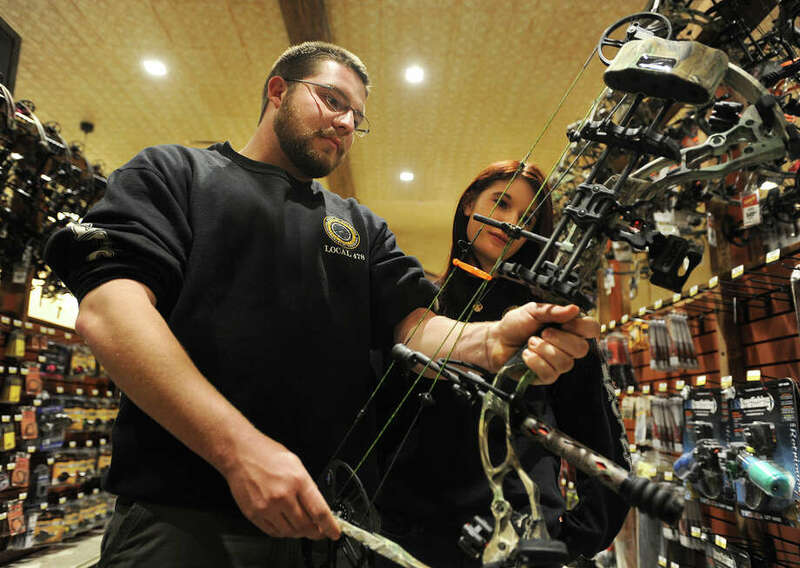 Visit Bass Pro Shop in Bridgeport for the 2016 Spring Fishing Classic beginning Friday, Feb. 12, for great deals on gear and local seminars. For more information, click here. Country star Phil Vassar brings his #noPHILter tour to the Ridgefield Playhouse on Friday, Feb. 12. Click here for more info. Laugh it up at the improv of Ron Hill, Anthony Reimer, Chris Booth, Rebecca Vigil, and many others on Friday. For more information, visit Bijou Theater's website. “Rock of Ages” on stage at the Warner Theatre in Torrington on Friday and Saturday, Feb. 12 and 13. Click here for more information. "Deadpool," starring Ryan Reynolds as a foul-mouthed superhero, opens in theaters nationwide on Friday, Feb. 12. Watch the trailer. Enrique Iglesias performs at Foxwoods’ Grand Theater on Friday, Feb 12. Find out more. "Where to Invade Next," the latest documentary by Michael Moore, opens in theaters on Friday, Feb. 12. Watch the trailer. The Bruce Museum will host “Fierce and Fragile: Big Cats in the Art of Robert Dallet" in conjunction with Hermès, a Parisian luxury items company and Panthera, a wild cat conservation organization based in New York. The 60-piece exhibit runs through March 13. Find out more. The O.A.R. is playing at Mohegan Sun on Friday, Feb. 12. Find out more. Fresh snow means there still time to enjoy winter. The Connecticut Office of Tourism has plenty of ideas on how to make the most of the season. Find out more. Blues artist Ana Popovic will rock out at Fairfield Theater Company on Friday, Feb. 12. Click here for tickets and info. Iconic and very personal images of the Beatles taken by Life magazine photojournalist Bill Eppridge capture the craziness of the Fab Four’s first six days in America, and are featured in a new exhibit in Danbury. The exhibit runs through March 13. Click here to find out more. Bernard’s in Ridgefield has Valentine’s Day events taking place Friday, Saturday, and Sunday. Find out more. II Volo will perform at the Oakdale Theatre in Wallingford on Friday, February 12. Find out more. The Walnut Street Theatre Co.’s production of Pulitzer Prize-winner Eugene O’Neill’s “A Moon for the Misbegotten” will take place at the Quick Center in Fairfield on Friday, Feb. 12. Find out more. America's Got Talent finalist Tom Cotter will be performing standup comedy at Mohegan Sun Friday and Sunday. Find out more. "How to Be Single," starring Dakota Johnson and Rebel Wilson, hits theaters Friday, Feb. 12. Watch the trailer. Greenwich Choices: 50 Objects That Illustrate Our History explores defining moments in the town’s growth and development through objects drawn from the collections of the Greenwich Historical Society. This special exhibit at the Greenwich Historical Society through February 28. Click here to find out more. Terrain in Westport invites you to a four course (plus dessert!) Valentine’s Day dinner in the Garden Café. Guests can attend on Saturday and Sunday. Explore the challenges of humpback whales’ annual 3,000-mile roundtrip migration between New England and the Caribbean at Norwalk's Maritime Aquarium. Find out more. Check out the ropes course for some zip-lining and climbing fun at Jordan's Furniture. Find out more. RiverQuest takes nature enthusiasts for a boat ride down the Connecticut River to take in the local scenery and possibly get a glimpse at some local wildlife—including bald eagles. Find out more. Celebrate a belated National Pizza Day and take a stroll along Connecticut's Pizza Trail. Find out more. Discover the romance of downtown Putnam with ice sculptures, horse and carriage rides, live music, ice luminarias, fire torches, fire dancing performances, fantastic food, and live entertainment on Saturday. Find out more. Discover the romance of downtown Putnam with ice sculptures, horse and carriage rides, live music, ice luminarias, fire torches, fire dancing performances, fantastic food, and live entertainment on Saturday. Hit the pavement and go go-karting at On Track Karting in Brookfield. Find out more. No matter where you are in Connecticut, there are always great options for oysters. Check out CTBites's 25 best spots for oysters in Connecticut. UConn men's hockey is battling the Providence Friars Saturday at Hartford's XL Center. Find out more. The Bridgeport Sound Tigers take on the Hartford Wolf Pack, Saturday, Feb. 13, at 7 p.m. Click here for tickets. Livingston Taylor will serenade listeners with his smooth guitar sounds Saturday, Feb. 13, at Fairfield Theater Company. Click here for tickets and info. Mix Master Mike, the DJ from the popular hip-hop group, Beastie Boys, will play at Mohegan Sun on Saturday, Feb. 13. Click here for more information. Check out some of Connecticut's comedy clubs, with shows running throughout the weekend. The Maritime Aquarium in Norwalk is hosting a special behind the scenes event only for couples, Saturday, Feb. 13. Find out more. Marc Anthony is performing a Valentine's Day concert at Webster Bank Arena, Sunday, Feb. 14, at 7 p.m. Click here for tickets. Take a Valentine's Day date on the Connecticut Chocolate Trail. Joan Jett and The Blackhearts will rock out at The Ridgefield Playhouse on Sunday, Feb. 14. Click here for more information. Get married for free in Mystic, Conn., on Sunday, Feb. 14, only. Find out more.